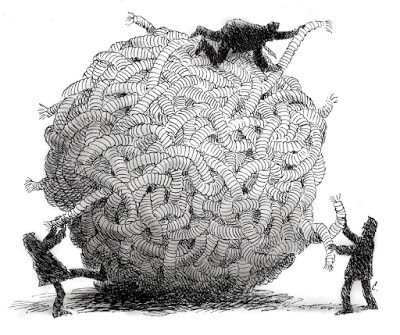 According to legend, the person who unraveled the Gordian Knot would rule the world. No one succeeded until Alexandar the Great took his mighty sword and sliced the knot in half. A young boy saw him afterward, crying on the steps of the Temple of Apollo. "Why are you crying?" the boy asked, "You just conquered the world. "Yes'" Alexander wept, "Now there is nothing else for me to do." Investors are not as cursed as Alexander the Great. But what challenges investors now are not new problems but unresolved old ones. The UK House of Commons vote that was expected next week now looks to be pushed out another week. Reports indicate that Prime Minister May brought nothing new with her request that the backstop is renegotiated. The backstop is in case there is no better agreement struck. There cannot have an expiry without giving the UK incentive to obstruct until it then. The UK has been unrealistic from the get-go. 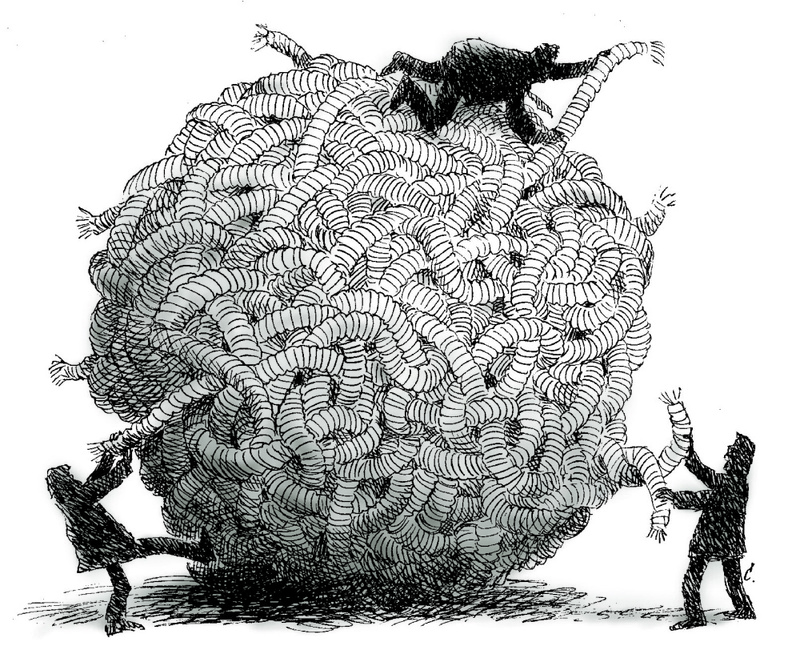 The Irish border makes the Gordian Knot look like a Cat's Cradle. The UK seemed to think that the EU would sacrifice Irish interests to ensure an orderly departure. Though it is not remarked on much, it is nonetheless remarkable that the EC has not wavered on this. The UK was never a member of the Schengen Area, and it had more control over its own borders than it chose to exercise. The politicos have an easy whipping boy in Brussels. UK officials say that after Brexit they can enter into free-trade agreements with other countries. But it is not like the EU is standing still. On February 1, the EU-Japan free-trade agreement went into effect. The EU has free-trade agreements with Australia, New Zealand, Vietnam, Mexico, Canada, Mercosur, and Singapore. The size of the EU market gives it negotiating power in trade talks. The UK GDP is about $2.6 trillion. To say it does not have the EU's heft is to state the obvious, but to suggest that the UK can strike just as favorable agreements seems naive at best and disingenuous at worst. The Irish border issue cannot be resolved. All of the stakeholders say the customs border cannot be between the Republic of Ireland and Northern Ireland. The Democratic Union Party from Northern Ireland that allows the Tories to govern after losing its majority insists that the border cannot be between Northern Ireland and the rest of Britain. The non-binding referendum in 2016 instructed Parliament to leave the EU. Now it turns out there is no majority in parliament for any particular way. Arguably, the House of Commons needs more instructions from the people and postponing Article 50 until after another referendum is one scenario. However, it was a very close decision last time and some irregularities. There is some risk that the Remainers would win. Despite the mess of Brexit, Labour continues to trail behind the Tories in opinion polls. Labour leader Corbyn has been unable to broaden his party's appeal, but he did offer another way to Prime Minister May. He made five demands in exchange for Labour's support. One of them was staying in the customs union, which would resolve the knotty problem of the Irish border. May is not ready for that yet. She sides with those Tories that believe that staying in the customs union is not a sufficient exit. Samuel Johnson said that when a man knows he will be hanged in a fortnight, "it concentrates his mind wonderfully." The March 29 departure is more than a fortnight away. The minds are not sufficiently concentrated. Hope seems to decay at the square root of time and as the zero hour is approached, and alternative exits are blocked, the choice may come down to a no-deal exit and a later softer divorce. Trade is another issue that must go to the brink. What White House Economic Adviser called the '"varsity team" of Mnuchin and Lighthizer are in Beijing next week to continue high-level trade talks ahead of the early March deadline. Reports suggest that while China is willing to talk about a wider range of US demands, its position has not changed much from the start It is willing to buy more US goods and reduce or eliminate the trade imbalance. It has already begun opening up more of its markets to foreign businesses. It has adopted more stringent protections of intellectual property rights. China cannot commit to the kind of structural reforms the US demands. It is pursued policies in direct contradiction of the IMF and Washington Consensus, and it has literally lifted hundreds of millions of people out of poverty. The US wants the Chinese state to withdraw from the economy. While there is an intuitive appeal but the closer it is examined, the less insightful it becomes. Imagine Chinese officials demand that the US government withdraws from the housing market, where through its ownership of Fannie Mae and Freddie Mac, it nationalized America's mortgage lending. Imagine Chinese officials complained when the US injected capital into all the large banks whether they asked for it or not. If the size of the state is measured as expenditures as a percentage of GDP than it is the US state that is the outlier for how small it is rather than the size of the Chinese state. Many critics see the US government as having encroached on the markets to an unprecedented extent, and now the US is insisting the Chinese state withdraws. It is an unrealistic demand that is tantamount to unilateral disarmament. Moreover, the US has this knack for turning a necessity into a universal virtue. In the 1980s, when the free-trade Administration thought it knew better than the markets, it coordinated intervention in the foreign exchange market. It has now successfully championed the G7 and G20 to formally recognize and endorse markets determining exchange rates. It was reported last week that Trump and Xi are unlikely to meet by the end of the month. Schedule conflicts were cited, but it is understood as confirming Kudlow's assessment that the two sides are still far apart. In addition to substantive issues, a key criticism of past agreements by many in the Trump Administration lies with a lack of sufficiently robust enforcement. "Trust but verify" makes more sense when you can see the deployment of missiles with satellites. It is more infinitely more difficult with these issues. Also, US officials have been critical of existing ajudication and conflict resolution mechanisms, but have not yet offered a politically realistic alternative. The US Administrations rhetoric does not match its action. After lambasting NAFTA as the worst agreement ever, the Trump Administration has submitted a new treaty for approval that is very similar to the older one, modernized with what had been negotiated under TPP (Trans-Pacific Partnership, from which Trump withdrew) and more robust domestic content requirements. The trade agreement with South Korea is not too dissimilar either. If such a pattern prevails, it will imply that after all the drama, when everything is said and done, the US-China relationship is not going to change very much. China will reduce the bilateral trade imbalance with the US. Leave aside the fact that this managed trade may be challenged by others at the WTO. It is in China's interest to de-claw American protectionism. In the recent past, the protectionists argued China was taking unfair advantage by maintaining an undervalued exchange rate. Now many models show the yuan near fair value. Now the protectionist blame other Chinese practices, some of which do not violate WTO rules. The US will not be able to convince a majority to change the rules because, at least in part, the same brush that that paints China would tar many others. The larger the technology gap, the greater the incentive to close it. Americans are quite willing to see it as a moral issue, though when they were on the weak side of the technology gap, say in the second half of the 19th-century in steel production, they too resorted to extralegal methods. Often China does not have to steal intellectual property right because foreign businesses agree under the terms of securing large, lucrative contracts. This one of the things that Alstom and Siemens, whose marriage was rejected by European authorities, reportedly have in common, for example. As part of conditions for over $1 bln in orders, each was required to transfer technology to the Chinese state-owned rail car manufacturer, which is now the world's largest train-maker. Besides Brexit and trade, a third issue that will remain unresolved in the days ahead is the state of the global economy. The synchronized expansion of 2017 had two legacies. The first was that collectively the central banks would reduce their balance sheet expansion and by early 2019 it would turn to contraction The second was that by the end of 2018, there was concern about a synchronized downturn. We submit the situation is more complicated. The reduction of BOJ purchases is because it complemented its QE with yield curve control. It needs to buy fewer bonds to achieve the same results. The 10-year JGB yields about minus three basis points, about the least in two-years. Some observers argued last year that the ECB was the only source of demand for some peripheral European bonds. This has proved wide of the mark. Demand for sovereign paper in the opening weeks of the year has been strong, including for Italian bonds. The 10-year German Bund yield slipped below 10 bp to a two-year low. The curve is negative out for nine years. We expect the ECB will resist through offsetting mechanisms the premature shrinking of its balance sheet from banks paying back loans under the previous Targeted Long Term Refinancing Operations. The US economy surged to over 4% annualized growth in the middle of last year as the fiscal stimulus kicked in, but it was always understood to be unsustainable. The world's biggest economy but 2.5% growth was is expected in Q4 18 is still above trend and is stronger than most of the high- income countries. Growth in Q1 19 will take a hit from the record long government shutdown, the cold snap, and the weakness quirk in the first part of the year that is common, even if not fully explicable, since the Great Financial Crisis. The US reports December retail sales. Households splurged in November, when retail sales, excluding autos, gasoline, and building materials, jumped by 0.9%. A still-strong 0.4% gain is expected in December. If so, it would be the strongest three months for core retail sales in seven years. January industrial output and manufacturing production may have ground to a halt in January, but the early data for February, like the Empire State manufacturing index, is expected to rebound. Meanwhile, headline January CPI was likely dragged lower by the drop in oil prices, but the core rate is likely to remain firm a little above 2%. The world's second economy restarts after the week-long celebration of the Lunar New Year. Given that it is the most important trading partner for some many countries, Chinese import and export figures are closely watched. China's trade surplus is poised to narrow sharply in January. Chinese reserve figures always attract attention. A small increase in reserves might not translate into more Treasury holdings, but it would lend support to ideas that the downside pressure on the currency eased in January (when the yuan rose above 2.6% against the dollar). Low CPI and PPI readings would play on fears of deflationary impulses, and a disappointingly weak report could spur speculation of a rate cut or a reduction in the required reserve ratios. Data from Europe will not shed much fresh light. However, data last week gives the first hints that Germany has worked through its auto issue. The flash PMI readings are due February 21, and some improvement is looking likely. The UK has a full slate of economic reports including Q4 GDP (the Bloomberg consensus calls for a 0.3% quarterly pace for 1.4% year-over-year, which would match the 2018 average and make for the weakest year since 2009's contraction). The GDP data will take the bite from the December data, which clears the deck for the January data. It includes CPI (flat) and retail sales (a small rise is expected after a large drop in December). Lastly, Japan will report Q4 GDP. The world's third-largest economy contracted by 0.6% in Q3 18, largely due to natural disasters. While there is no doubt the economy recovered in Q4, it probably was not economy to offset the decline. The median forecast is for the Japanese economy to have expanded by 0.4% in Q4 as both consumption and investment rebounded. Disappointingly, the GDP deflator may have slipped further to -0.4% from -0.3%.